This new design bundle contains a massive range of quality texture and pattern resources. Each item is a comprehensive product in its own right, but together this collection provides a complete library of unique design tools to use in your projects. You’ll find commonly required assets like old paper scans, chalkboard backgrounds and subtle distress textures, alongside a selection of more abstract resources that can help you produce really creative pieces. For a limited time only you can pick up this entire bundle with a 99% discount, which reduces the $2217 price tag to just $29! 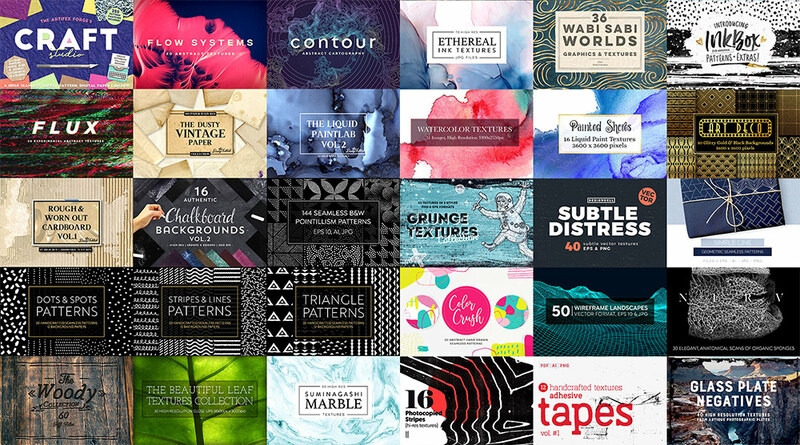 Every item in the Totally Extensive Textures and Patterns Bundle is supplied with extended licensing, which gives you the freedom to use them in your commercial and client projects. The quality is on point too, with all textures being high resolution and the patterns repeating seamlessly. The majority of these products are supplied as widely supported file types such as JPG, PNG and EPS, which means this bundle particularly useful for designers who use alternatives to the Adobe software!